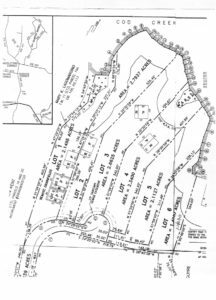 6 waterfront lots on Cod Creek in Northumberland County in Virginia’s historic Northern Neck on Cod Creek. Cod Creek is a creek in the lower part of the county and leads into the Potomac River. Come out of the Creek and look across the Potomac River to Point Lookout Maryland. Turn your head to the right and you out of the Potomac River into the Chesapeake Bay. Water depths are suited for most mid size outboards that are primarily used by today’s boaters which allow you to cruise the rivers and Chesapeake Bay for cruises to such places as the Saint Mary’s River in Maryland, Smith and Tangier Islands, Solomons, Maryland, or cruise down the Bay and visit the Eastern Shores and small towns like Cape Charles, Virginia. All 6 of these waterfront lots have Virginia Health Department certification letters for a septic deposal system. All 6 of these water lots have been cleared and are ready for you to build the home of your choice. Virginia regulations allow for each resident to have two crab pots per person. So a family of 2 can legally fish 4 crab pots from their pier or boat. A family of 4 could have 8. You get the point. Enjoy catching large rockfish, Striped Bass, during the spring trophy season and during the the fall migration. During the summer months you are allowed 2 rockfish per day per person but they won’t be those trophy fish. Personally I think the smaller ones are the best eating. You can search for all active listings in the Northern Neck MLS at your convenience. My success depends on your success. I’ll negotiate for you as would for myself.